When it comes to invitation design, think Parisian soap label art, Givenchy couture, and swirl or damask patterns. To extend the design's shelf life, give your cake baker a copy of your invitation and ask him or her to decorate the cake using a similar design. Monograms are becoming more thematic via stylistic elements, like elaborate ampersands. Rather than a simple font, consider using intertwined initials for an updated look. Invitation envelopes are your guests' first glimpse at your wedding style, so don't skimp on them. Beautiful liners in coordinating colors and patterns make this otherwise ordinary packaging a memorable wedding detail. 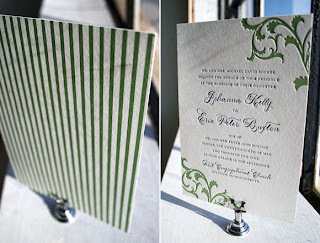 Says Cynthia from Bella Figura, here are some more trends from the wedding stationery front. Hope that's enough to get you inspired for now!